It is estimated that approx 15 million people in theUnited States suffer from daily heartburn symptoms, whereas more than 60 million Americans experience these symptoms on a monthly basis. These surprising statistics place heartburn as one of the most prevalent medical disorders in the western world. Heartburn is a burning sensation in the chest and/or throat, often accompanied by a bitter or sour taste in the back of the throat. While healthy individuals can occasionally experience heartburn, persistent heartburn, experienced twice a week or more, is considered to be the most familiar symptom of a medical condition called acid reflux, of GERD (gastro esophageal reflux disease). Gastroesophageal reflux disease occurs when the lower esophageal sphincter (LES)-a ring of muscle that acts as a valve between the esophagus and the stomach-does not close properly and stomach contents leak back, or reflux, into the esophagus. When refluxed stomach contents touch the lining of the esophagus , heartburn strikes. These stomach contents are a mixture of digestive enzymes, acid, and other substances that can irritate the lining of the esophagus, causing painful burning. It's important to note that heartburn is the most common acid reflux symptom, yet isn't the only GERD symptom. Additional typical symptoms of gastro esophageal reflux disease include: indigestion syndrome, chronic dry cough, chest pain that mimics a heart attack , voice change, hoarseness, globus pharyngis (the feeling of a lump at the back of the throat) and otalgia (ear pain). In addition to the typical symptoms, untreated and neglected acid reflux can lead to various complications; some can be extremely severe. For instance, untreated GERD can develop into peptic stricture - the narrowing of the lower esophagus as a result of injury and scarring of the area. Peptic strictures typically manifest as difficulty to swallow and the sensation of food sticking at the bottom of the throat. For those reasons, peptic stricture sufferers tend to avoid eating and may lose weight. Another severe complication of acid reflux is Barrett's esophagus. Since the lining of the esophagus is exposed to the leakage of stomach acids on a regular basis, the human organism tries to protect itself by growing cells similar to those found in the lining of the intestine (condition known as Barrett's esophagus). This tissue helps relieve heartburn symptoms. However, while Barrett's esophagus itself may be asymptomatic, about 2% of patients develop a deadly type of cancer called esophageal adenocarcinoma as a result of that process. Men over 45 with a history of at least 10 years of experiencing heartburn symptoms share the highest risk to develop cancer. GERD related pain could be temporary relieved using prescription medications or over-the-counters that are mostly aimed on diminishing heartburn symptoms by suppressing acid production in the stomach. However, this approach to treating heartburn tends to overlook the root internal causes of acid reflux. Acid reflux is a multi-dimensional condition that is triggered by several underlying factors, including: lifestyle and environmental related factors, dietary patterns, , genetic tendencies, over acidity and toxins in the blood, sluggish digestion etc. For this reason alone, medications that deal with the symptoms of GERD would almost always fail to provide a long-term and effective solution to acid reflux sufferers. 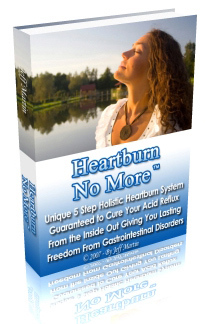 Did you know that your painful, distressing heartburn symptoms could be completely and permanently stopped following an all-natural holistic therapy? This type of therapy combines specific dietary alternations and comprehensive lifestyle changes along with the intake of specific herbal and vitamin supplements as well as detoxification and Candida control protocols. Only by choosing the holistic approach, you will be able to eliminate your acid reflux from the root and permanently prevent its recurrence.